A couple of days ago, someone came to me to explore via the Gaian Tarot how to make creativity the core of hir work. Here’s the layout we came up with. I hope you find it valuable in your own creative journey. What is my greatest creative strength? What mode(s) of expression are best suited to this creative strength? What is my next step in making creativity the core of my work? What inner resources support this next step? What outer resources support this next step? What gift to myself can emerge from this process? What gift to the world/cosmos can emerge from this process? My friend Jeannette and I took the train to Guelph on Friday and spent time with our friends Eimear and Ed in Fergus. On Friday evening and Saturday afternoon, we enjoyed being in the presence of poet, activist, and teacher Drew Dellinger. Both times, Drew talked about the cosmology of Thomas Berry, the universe story as we now understand it, and enthralled us with his passionate and cosmically rooted poetry. Friday included references to the later work of Martin Luther King Jr. Saturday’s session also saw us do some creative writing activities with Drew. The thrust of our time with him was that cosmology, ecology, and social justice are all united. What a society believes about the origins of all things influences how it treats all things. Drew is personable, smart, and engaging. Do see/hear him if you can. He’ll make you think and maybe even act. I come away with a deeper awareness that everything/everyone is an incarnation of the Great Flaring Forth or Primordial Flaring Forth; therefore, every being (both human and more-than-human) is worthy of respect and celebration. Every being took billions of years to become what it/she/he is, and that merits reverence and praise. Department Store as Council Container? More and more, I notice conscious conversations cropping up in less-than-formal settings. A simple “hello” becomes a talk about what’s happening in the world. An innocent “take care” morphs into a conversation about excellent ways to stay mentally and physically balanced. While in a department store at Yonge and Bloor here in Toronto, two conversations about spirituality and religion came up completely independent of one another. First, in the fifth floor restaurant, I ordered breakfast, asking R. to omit the bacon because I’d already eaten some bacon this week. R. asked if it’s because of Lent to which I replied, “No, I don’t observe that anymore.” “How come?” inquired R. as she scrambled the eggs. “Because I no longer consider myself a practising christian, although I do consider myself a practising spiritual person,” was my reply. R. then said, “My brother and sister-in-law go to the United Church, but I wish they’d come to my church instead.” My response was, “Well, we all have our own path to spirit and I think that’s beautiful.” And R. said, “Yeah…but…if they’d only come once they’d see…” And so on until I had a yummy breakfast handed to me with early happy Easter greetings. Next, in the men’s accessories department, I walked over to S.’s cash register to pay a bill and greeted him. S. greeted me back with a huge smile, so I asked, “What’s making you so happy today, S.?” He replied, “This morning I got up happy and said thanks to God. Then I went on my computer and got the Buddhist thought for the day, even though I’m officially Catholic, and the thought for the day was inspiring.” “I think that’s so great, S., that you honour the different religions,” I chimed. He said, “Yes, there’s something of value in every one of them, and something hard about every one of them.” I came back with, “When you think about it, whether a person is buddhist, muslim, christian, jewish, sikh, pagan, or whatever, the basic message seems to be ‘BE KIND’.” S. nodded, smiling even wider as he shared, “I teach my kids that our Sri Lankan culture, Canadian culture, and every culture in the world has beauty and to do no harm to anyone or to creation.” And so on. What I heard in this shopping venue “circle” were two different perspectives. One of the points of view is that others should be more like oneself rather than practice something else. There was an element of fear in the tone of it. The other point of view advocated embracing the best of as many practices as possible. There was great spaciousness in this. Having said that, both people are very friendly and they’re helpful in their professional roles. Our in-store council invites me to be aware of when I might be in “conversion to my worldview” mode and when I’m embracing the best that everyone is. Be kind. Not a bad message to pick up in a department store. Blessed Be. What are the unexpected council containers in your experience, friend? Where do the surpising conversations that matter take place? Many of you know that I enjoy working with round tarot cards. The Motherpeace, Daughters of the Moon, Songs for the Journey Home, Star That Never Walks Around, Circle of Life, and Cloisters decks are all lovely and their shape reminds me that a tarot consultation is a circle of sorts, a conversation that matters with the card layout as our consciously created centre. People often ask me about the various orientations one can get with round tarot cards. Not only is there upright and reversed, there’s also the possibility of various degrees of tilting to the left or right. Karen Vogel and Vicki Noble, the Motherpeace artists and writers, see a tilt to the left as less of the card’s concept being expressed and a tilt to the right as more of it being expressed. Some folks think of a round card as a complete cycle of lunar phases with reversed as “dark moon”, upright as “full moon”, with the other positions as being new moon, quarter moon, etc., letting us know if the energy depicted in a card is waxing, waning, in its fullness, dormant, or somewhere in between any of these. When using rectangular cards, I see upright as obvious, conscious, external, giving, and so forth. I see reversed as subtle, unconscious, internal, receiving, and so forth. So, for me, a round card that’s tilted indicated that the concept is experienced both externally AND internally, consciously AND unconsciously, privately AND publicly, etc. It reminds me to observe and listen to the outer world for the card’s message and to be aware of that mirrored in my inner world. Also vice-versa. For example, my card for today, from the Motherpeace Tarot, is the 6 of Cups, tilted to the right. My sense of the card is that both my external friends and my own intuitive guidance are reliable, that I’m comfortable in my relationships with others and in my relationship with myself, that it’s good to give and receive pleasure today. So there’s my twist on the nuances of round cards. Any thoughts from you? On Saturday, March 20, twenty-one of us gathered in an events room in downtown Toronto to explore and celebrate tarot together. Five of us were presenters, each of whom enjoyed taking part in the others’ presentations. 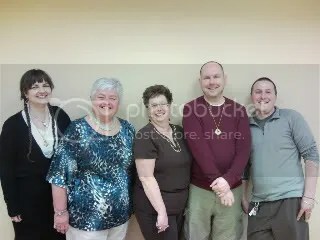 Here’s a spiffy photo of us — Monica Bodirsky, Bev Haskins, Marilyn Shannon, me, and Andrew McGregor. Thanks to Peter LeBlanc for taking the picture on Marilyn’s camera. We gathered in — what else? — a circle. A central cloth contained the World card in the centre and the four Aces in the four directions accompanied by a feather, a stick, a chalice, and a stone. Bev’s three-card layout for being more compassionate with another person was very useful. It made me reflect on what I don’t know about someone that would help me see them in a kinder light, even when it’s difficult to do so. Bev also had us think of one quality we would like to express with ALL people and pick a card from our face-up tarot deck that most looked/felt like that quality. The Motherpeace 9 of Wands I chose reminds me to be rooted in my centre. Monica offered us a thought-provoking talk on tarot ethics and the perceptions of our profession “out there”. People got fired up about ways that we might reframe or repair common misconceptions about the practice of tarot reading. I’m amazed that there are still incredibly archaic laws on the books rooted in superstition and a lack of separation of church and government. The discussion made me happy that I call myself a tarot consultant rather than a reader, because of my more interactive approach. My own presentation consisted of remembering that all beings, human and more-than-human, possess innate intelligence of some form and that we can dialogue with that intelligence through the cards. The first activity is to draw a card from your deck to represent a being(s) who wants to communicate with you. Any subsequent cards are questions that the being(s) wants to pose and that you must answer honestly, creating a dialogue towards how you can be a more life-affirming presence on this planet. The second activity is to do the Gaian Layout that’s printed in Joanna Powell Colbert’s book that accompanies her Gaian Tarot. Andrew offered us ways to use unseen cards in a reading. The activity we did was a wonderful way to read tarot interactively and to take the client out of hir usual responses. The client draws a card from the deck that only s/he looks at throughout the session. The reader/consultant doesn’t ever see it. The reader interprets each card in the layout, finishing each card with one or two questions that the client responds to from the perspective of hir private tarot image. Very cool! Andrew also said we can lay out an unturned card for the Mystery, one that only the reader sees to guide hir through the session, and much more. Marilyn’s session was about court cards and was a great deal of fun. After brief role-played declarations in the group about whatever court card we received, we got to make our own collaged cards from cut-out pictures glued onto colourful backing. Then Marilyn laminated them for us and we got into pairs to read our partner’s new card. My reading partner, Gerald, said something about mine that delighted me: “This is a man who is at home where he is.” Very true. We kept the events moving on time and people really enjoyed the prizes. Peter LeBlanc recorded the presentations, so who knows…there may be a CD or other audio form of the symposium in the near future. A huge bow of gratitude to Tatjana for providing the space for us. Another huge bow of gratitude to my fellow presenters. Yet another deep grateful bow to all who attended. Please come again! Yesterday, my partner Steven received a ‘phone call from his sister to say that his dad died in the night. It was unexpected. And, as you already know, my final grandfather (at one point in my life, I had 11 grandparents due to various configurations of remarriage) died last week. The males of the last two generations have been leaving. Your final physical grandfather is gone. This is your first initiation into sagehood. How can you now be your own grandfather? Good question. I suspect that I’ll spend the next few years unpacking that one. In my mind’s eye, I saw images of all the Sages from the Voyager Tarot, the Hermit from the Gaian Tarot, the Priestess of Swords and Shaman of Discs from the Motherpeace Tarot, and the Seven of Stones from the Shining Tribe Tarot. Also the 10 of Cups from the RWS deck. Some people get visions of sugar plums dancing in their heads; I get tarot cards. One way for the ancestors to get ideas across to me. I continue to explore these images’ relationship to this time of death and initiation. So…please join me on my journey to sagehood. Let’s find out together what that might look like. Blessed Be. I’ve written before about the importance of preparing for a tarot session. It’s important to do the lead-in work for ANY process or gathering. Yesterday, our mastermind circle met to listen to what each member needed to say about hir business/work and to offer helpful suggestions to one another. The night before, I sat down with my journal to write about successes I had had since our previous meeting, my goals for the current gathering, and any requests I had for the group. This helped me to notice a theme around what had been working well in my work over the past month. Becoming conscious of this theme assisted in the sculpting of specific goals for the time in between our current meeting and our next one. Having clear goals and themes gave my circlemates a firm grounding in what type of feedback would be of value to me. In addition, I created a visual component in the centre of the low table around which we gather. In a beautiful pewter bowl, I placed a bunch of serviettes that are printed to look like $100 bills. Around this, I placed a book with an image of the Milky Way galaxy and a picture of a group of people engaged in heartfelt council. This visual centre reminded us during the gathering that we serve the greater Cosmos/Life, we do so in a state of council mind and clear communication, and that it’s OK to earn good money in the process of doing that. Our meeting on Monday flowed swimmingly. By doing the shadow work beforehand — ranting, bitching, complaining, worrying, etc. — on the pages of my journal, I ensured that I didn’t carry this highly charged energy into our circle, thereby saving us from a potentially damaging interaction. I even read the journal entry aloud to begin my portion of circle time and mentally envisioned the words going to the centre (neutral space that holds our best intention) so that I was clear before speaking all of my successes since we last met and my postitive goals for the upcoming month. It provided a good laugh in the group and made us all aware that we carry “stuff” with which we need to cope. If we do the prep work, we keep our interactions and intentions clean. I also didn’t waste my own or anyone else’s time, because of my focused goals. What’s YOUR favourite way to prepare for an intentional process? Please teach us, dear friend.